We’ve all been to that point where there is just not enough room to put all of our hair tools/products in an organized manner in the space that we need them. This becomes more and more of a problem with so many new hair products coming out. So what are our options to be able to get this needed space so that our get ready area isn’t just a giant cluster? Instead of breaking up our entire family or racking up and insane debt bill let’s look into the more realistic approach. You can do the simple approach of just cleaning out your bathroom of unneeded junk which you’ve probably already thought of but this option may not be a resolution for some because you just have a lot of stuff you actually do use often. Stop using so many different products/tools. This could go in the non-realistic section depending on the person because I know a lot of people (mostly the ladies) that would find this option to be ludicrous! 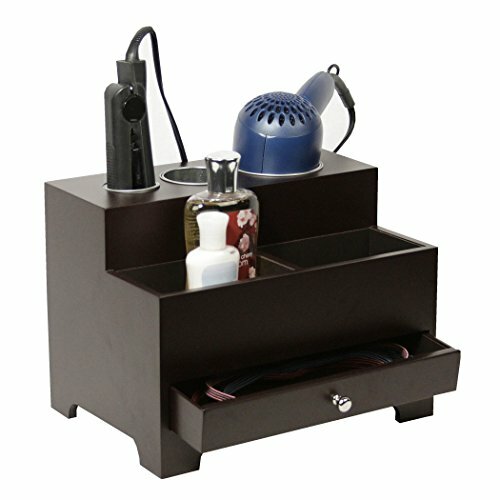 My suggestion to help solve this problem is look into buying an organizer for your bathroom/dressing area. 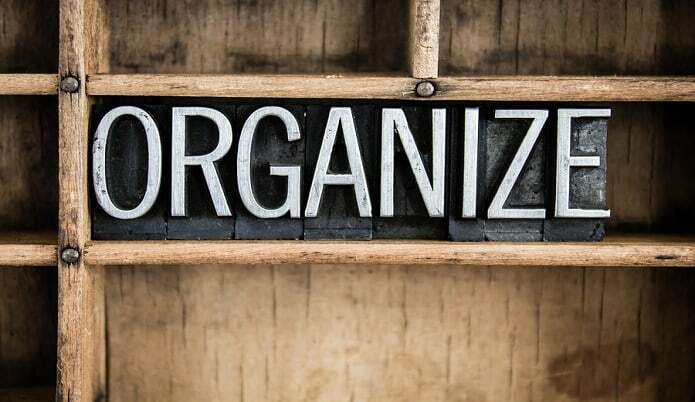 There are a wide variety of these organizers things that you can find that should at least be able to help your organization/space issue even if it doesn’t solve it completely. Let’s take a look at the one I recommend. This one is my favorite for many reasons which I’ll list below. 1.) It’s a counter organizer not a wall setting one. I truly do not like using the wall hanging organizers for a variety of reasons but mainly because I don’t know how many times I’ve went to hang something like my hair dryer on the wall and it move some or just me being not fully awake yet and miss it then it fall from the wall down to the floor breaking the item. The perk of the counter one if it misses/falls it only falls about 4 inches which usually isn’t enough to do any damage. 2.) It does not take up a lot of room which is the whole purpose of us looking into getting one of these. Despite its size though the way it’s built, compartment wise allows for a good amount of room to store products. 3.) 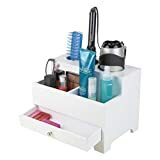 The hot holding tools area allows you to set stuff like a hair straightener/curling iron in there without turning it off while you fix your hair without damaging the organizer. This may not interest a lot of men but for women this could be pure gold because my sisters were always leaving there hot hair items on the bathroom counter by accident and would forget to turn them off. This becomes a big bonus if you have little ones running around who like to grab anything they can see. 4.) If you don’t need those areas for holding items like that then you can always just use that space to hold extra hair products. 5. )Comes with a built in power strip in the back to help with multiple cords/plugs. This speaks for itself because trying to manage multiple cords is a true pain. 6.) It looks really good and has a premium quality feel to it. Finding enough room to keep the things you need can be very frustrating but don’t go to any extreme measures until absolutely necessary. Try getting an organizer like I mentioned above and go from there. If it works but you find that you’re still needing more room then maybe a second one in a different section of the bathroom can finish it off.